Hounslow Heath, Middlesex Showing the Hussar Pub in Staines Road c1913. This is the pub shown in yesterday's post. There is still a pub called the Hussar here but it is very different. It was probably named after the 7th Queen's Own Hussars who were stationed at the nearby Hounslow Barracks. 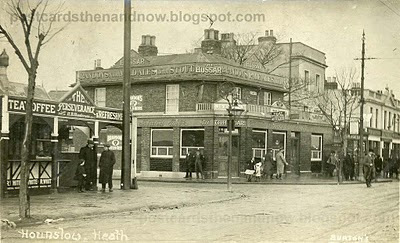 On the left is The Perseverance tea and coffee stall run by a man with the wonderful name of Henry Blizzard Henderson. This postcard was published by the newsagent George Burton of 345 Staines Road Hounslow, but the photograph was probably by Young & Co (the writing style of the caption is identical to Young's later postcards). Burton mainly published postcards of Hounslow Barracks. Click to enlarge. Well, the first one is obviously more inviting. Now, about those crooked lines I see on U.K. streets - what the heck are they? Gives me a sense of vertigo, which would probably slow me down a little too.